In 1938, seventy five years after the fight, at the last great reunion of the Blue and the Gray at Gettysburg, a small group of veterans from Virginia and Pennsylvania met near the "Angle." As cameras rolled and clicked, the old gentlemen shook hands over the stone wall where General Hays' Division stood on July 3, 1863. Though it is unknown whether any of these veterans were actually present during the fighting at the Angle, this particular photograph was used to publicize the event and illustrate the last meeting of the two associations that had met at the Angle up to 1913. By 1938, there were barely a handful of veterans surviving from either army, who had actually been at Gettysburg seventy five years before. Twenty years prior to this reunion, the First World War had ended, and three years later, in 1941, Pearl Harbor would be attacked and the nation would be thrust into the war of all wars. 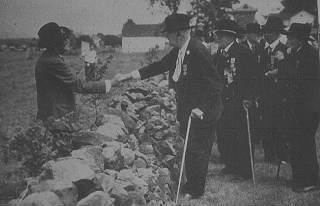 Handshake over the stone wall, July 3, 1938. The 1938 Gettysburg Reunion, aka 75th Anniversary of the Battle of Gettysburg, was commemorated June 29 through July 6 on the Gettysburg Battlefield and attended by approximately 25 veterans of the battle and an additional 1,359 Federal and 486 Confederate veterans out of the 8,000 surviving veterans of the American Civil War (1861-1865). For the event, the Federal government funded or provided each veteran with transportation, quarters, subsistence, and if required, an attendant. President Franklin D. Roosevelt's July 3 reunion address preceded the unveiling of the Eternal Light Peace Memorial; a newsreel with part of the address was included in the Westinghouse Time Capsule for the 1939 New York World's Fair. Although several decades had passed since the Civil War, numerous inventions and technological innovations had occurred. From Reconstruction to the 75th Anniversary of Gettysburg, inventions included the telephone, phonograph, incandescent light bulb, electric fan, escalator, automobile, air conditioning, airplane, television and radio. And while the Panama Canal had been built, the guns of the First World War had also long since been silenced. 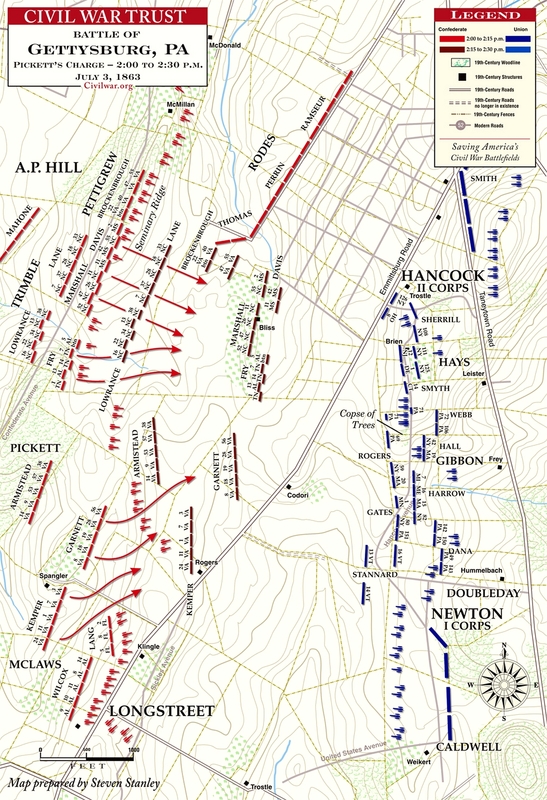 Sources: Gettysburg National Military Park; Gettysburg Celebration to be Attended by 3,500 Vets". The Daily Times. June 11, 1938; Blue, Gray Veterans Gather At Gettysburg for Reunion". Reading Eagle. Jun 29, 1938; Flame Burning on Monument at Gettysburg". The Telegraph Herald. July 4, 1938; Library of Congress; National Archives.